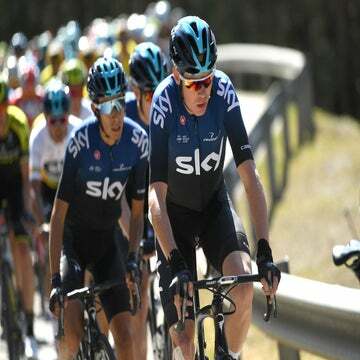 GUILIN, China (VN) — Eddie Dunbar had plans to race in the second division in 2019, but now takes advantage of Aqua Blue Sport’s sudden team shutdown and a new Team Sky contract. The talented 22-year-old Irish cyclist found refuge in cycling’s biggest team when Team Aqua Blue announced its closure. In the next season, he has the chance to race alongside Chris Froome and Geraint Thomas and debut in a grand tour. “I appreciate what Sky has done to give me this opportunity,” Dunbar told VeloNews. “Obviously, Aqua Blue folding is disappointing. For this to all happen so quick is crazy but Sky were kind enough to get me involved, get me racing as quick as possible, to get to know the riders and staff. Aqua Blue’s closure put many out of work. Dunbar and others like American Larry Warbasse, who is joining AG2R, were some of the fortunate few to find teams. Dunbar, from Cork, won the Under 23 Tour of Flanders in 2017 and this 2018 season, placed eighth in the Tour de L’Avenir. Soon after Avenir, Dunbar heard Aqua Blue folded. But an opportunity presented itself. “It’s going to be a year of learning, going from Pro Continental to the WorldTour, and one of the best teams in the world. It’s a massive learning process. Dunbar has been unable to participate in many stage races. He wants to do so to “develop more” in the coming year. Dunbar began racing in Sky’s blue and white colors mid-November in Italy’s one-day races. He closes 2018 in China’s Tour of Guangxi. Given how Egan Bernal performed in his first grand tour at the age of 21, Dunbar sees all sorts of opportunities. “You look at it, every year there are younger guys doing grand tours. Bernal is a year younger than me and he was in there smashing it in the Tour,” Dunbar added. Will the stars finally align for Team Sky in its last “Hell of the North”?